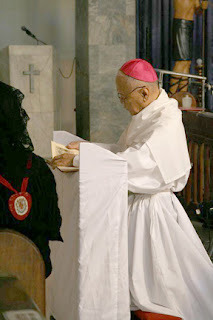 Bishop Angel Hobayan, bishop emeritus of the Diocese of Catarman, celebrated a Pontifical Low Mass with Father Michell Joe Zerrudo serving has his first chaplain at the Parish of the Lord of the Divine Mercy, Sikatuna Village, Quezon City in observance of Ash Wednesday, the start of the Lenten observance for all Catholics. The Mass was solemnly assisted by faithful from both the TLM community and parish community of the said church. 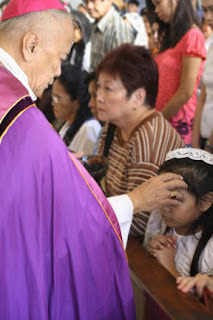 Before the Holy Sacrifice of the Mass began, the good bishop wearing his zucchetto and vested in an alb, stole and purple cope stood at the epistle side of the altar where the vessels containing the ashes are to be blessed. After blessing the ashes, he received the ashes on his own head and proceeds to place them, in the form of a cross, on the foreheads of Father Zerrudo and the rest the faithful present with these words from Genesis 3:19 Memento, homo, quia pulvis es, et in pulverem reverteris (Remember, man, that thou art dust, and unto dust thou shalt return). 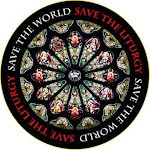 After all has received the ashes, the bishop said a short prayer then, wearing a roman chasuble, proceeds to begin the Holy Sacrifice of the Mass with Father Zerrudo as his first chaplain. After the Holy Mass, the good bishop was greeted by the faithful with much gratitude, enthusiasm, love and respect. In a little over a weeks time, this is the second Pontifical Low Mass offered within the Diocese of Cubao after Pope Benedict XVI promulgated his Apostolic Letter Summorum Pontificum given motu proprio.